Our whole purpose behind this platform is for you to present more and manage less. We want to help you as much as we can to make your next CEU Event more successful. 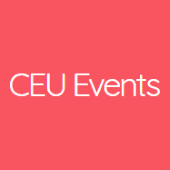 Sign in to www.ceuevents.com and you will be able to start scheduling CEU Events. We also created a CEU Events Instructor Essentials 101 Manual for you to make things as easy and simple as possible and you also may find our CEU Events Instructor/Presenter Handbook helpful especially if you are new to CEUs. The success of your CEU Events is very important to us. Please let us know your feedback and/or suggestions after using our services. Thank you for your support and your business.